This Guilders Stone was originally the key stone of the old bridge, built 1815, removed 1876. 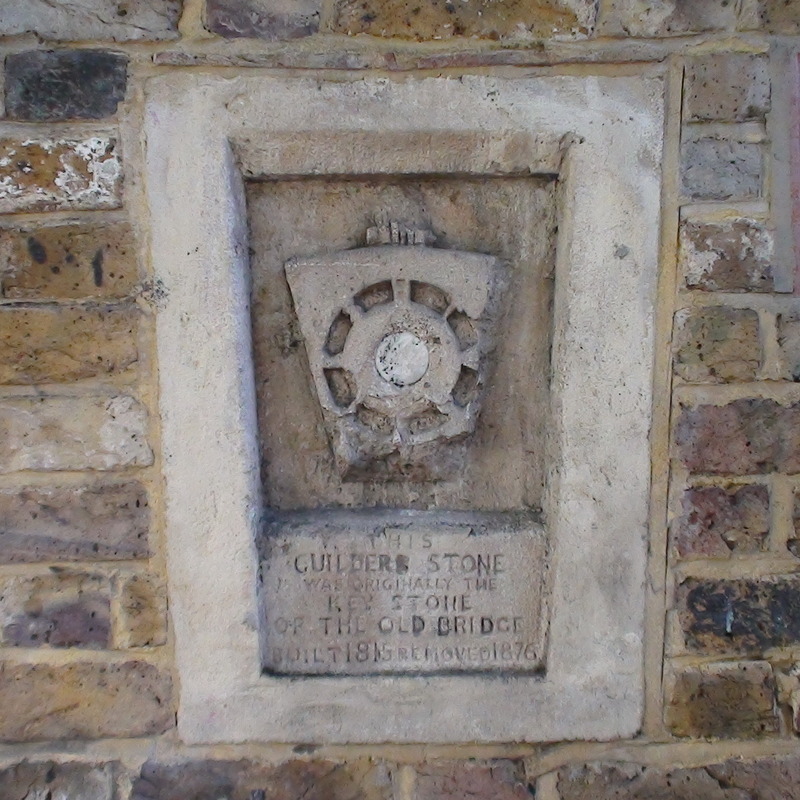 The phrase "Guilders Stone" has not been explained, other than a suggestion that it originally read "Builders Stone" and that a 1990s renovation might have caused the error. It's easily in living memory - surely someone knows more. We'd also like to know the significance of the central white stone, the spoked wheel and the crest. Having already published this stone in 2016 we were delighted to spot it in an old movie, in a slightly different position. The 1961 CFF film "The Monster of Highgate Ponds" (a catnip title to a London cinephile) shows the plaque (at c.50 minutes) in its previous location. Whereas now the path from the canal up to road level runs to the west, and then back to the road, via a 2-part accessible ramp, it used to run up a single ramp beside the road so there was just a wall and railings between the path and the road. This plaque used to be on that wall. When the double ramp was introduced the plaque was rescued and re-erected on the wall between the 2 ramps.We captured the frame and you can see that the plaque already has the explanatory text referring to its previous move in 1876.